Mein Name ist Manfred Schleßelmann und ich habe unsere Familienseite gestartet. Sie wurde mit Hilfe von MyHeritage.com erstellt und der Stammbaum kann auch nur durch den Webmaster geändert werden. Mit dieser Seite ist es möglich den Stammbaum kontinuierlich weiter zu entwickeln und Familienfotos zu teilen. Wenn Sie Kommentare oder Feedback zu dieser Seite haben, klicken Sie bitte auf here, um mich zu kontaktieren. Welcome to the Schleßelmann family web page. My name is Manfred Schleßelmann and I started genealogy research about the Schleßelmann family in 2008. This web site contains all what I’ve found so far. I would be very happy if you could support me in the extension of this family tree. The tree starts with Caspar Schlesselmann, who was born 1654 in Groß Meckelsen, North Germany. I found other families with the same name and similar spellings living in North Germany in the middle of the 1500. But the relation is not clear yet. The origin of the name is coming from the village Schleeßel. A very small village not far from Meckelsen located between the rivers Elbe and Weser. The first part of name “Schlee” is the bush sloe. second part “Sel” or “ßel” means in old German colony (human Settlement). The meaning is therefore the colony within a veldt of sloe. In Jordebuch from 1694 village was named Schlesel, later Schlesell, Schleßell and now Schleeßel. The increasing internationalization of the name is now often written as Schleessel. The first Schlesselmann probably got the name because he moved from Schleeßel to somewhere else. He was therefore the "Schleeßelmann" (Man fom Schleeßel). Or in other words, the man who came from the village in the middle of the veldt of sloe. I received from the University of Leipzig a certificate of conformity about our name. It is published on this site. Click on Family Pictures (Familienfotos) and than then open the folder "Familiengutachten". There you will find Foto copies of this certificate. The meaning of Schleeßel itselfs is a bush called sloe (German “Schlehe”). This is the historical tradition and therefore the crest of Reeßumcontains a blossom of a sloe. Scheeßel is a part of the community Reeßum. Conspicuous is, that the letter ‘ß’ appears very often in different designations (Schleeßel, Scheeßel, Reeßum or even Schleßelmann). This has maybe to do with the old language (Lower German "Plattdeutsch") that some people still speak until today in this part of Germany. Our family tree is posted online on this site! There are 24914 names in our family site. Die Seite wurde zuletzt am Apr 17 2019 aktualisiert und hat derzeit 59 registrierte Mitglieder. If you wish to become a member too, please click here. Viel Spaß! Der komplette Inhalt dieser Homepage steht nur den Mitgliedern zur Verfügung. Alle Angabe noch lebender Personen werden nicht öffentlich gezeigt. The complete content of this homepage is only for members accessible. All information of living people will not be displayed and is only provided for members of this page. My name is Manfred Schleßelmann and I started our family site. It is made with MyHeritage.com and changes of the family tree will be made only by the webmaster. With this site it will be possible jointly to develope the family tree and share family pictures with you. If you have comments or feedback to this site, please cklick here here, to contact me. The last modification took place at Apr 17 2019 and we have 59 registered members so far. If you wish to become a member too, please click here. Have fun! Manfred Schleßelmann updated the details of <Private> Tarango in family tree Schlesselmann Family Tree. Manfred Schleßelmann added <Private> Tarango to family tree: Schlesselmann Family Tree. Manfred Schleßelmann published a new version of the Schlesselmann Family Tree family tree from the Family Tree Builder. Manfred Schleßelmann updated the details of Harm Cords (Cordes) , Gesche Cordts (geb. Klindworth (Klindwort)) , Harmen "Harm" Cords (Cordes) , Metta Viets (geb. Schlesselmann) and 22 other people in family tree Schlesselmann Family Tree. Manfred Schleßelmann added Paul W. Heller to family tree: Schlesselmann Family Tree. Manfred Schleßelmann updated the details of William Clinton Schlesselman , Ela J. Jones (geb. Faurote) , Jame Jones , Ina Janette Manatt (geb. Jones) and 19 other people in family tree Schlesselmann Family Tree. Manfred Schleßelmann added Ela J. Jones (geb. Faurote) , Jame Jones , Anna Hoffman (geb. Wolff) , George J Hoffman and 10 other people to family tree: Schlesselmann Family Tree. Translation of letter from Johann Kogge (Grandpa John' cousin in Germany) sent to Grandpa Johann Diedrich 'John' Schlesselmann 1874-1949.
we make do with old machinery and equipment. Germany (Ramond Joachim Schlesselman 1922-1988) had told that to us. families. One moved away to South Germany. One of the family relationships that I did not hear much about as I was growing up was that of the Schlesselman family. My grandfather Jacob Pape’s older sister Adelheid came to the U. S. several years before he did. After arriving in Concordia, she married Peter Schlesselmann. The 1900 census records list Peter and Adelheid’s family with three children; Anna, August, and Ella. Both Peter and Adelheid declared that they had immigrated to the U.S. in 1882. Based on this clue, I found an entry in the passenger list for the Ship Baltimore that sailed between Bremen and Baltimore, MD. For the voyage that arrived in Baltimore on May 8, 1882, the following names are listed in order. That was an interesting group. They listed their destination as Illinois. If they stopped there at all, it couldn't have been very long because Peter and Adelheid were married in Concordia on May 3, 1883. I'm not sure why they decided to come to Concordia, probably because they were related to or knew people there. There was a Henry Schlesselman already living in Concordia at that time. He was 5 years younger than Peter, but may have been a brother. I don't think our Pape family had any relatives in Concordia at that time. Jacob Martens settled somewhere in Davis Township. He and Peter probably remained close friends because his son John married Peter and Adelheid's daughter Ella. The Schlesselman photos and memorabilia wound up with the Martens family. 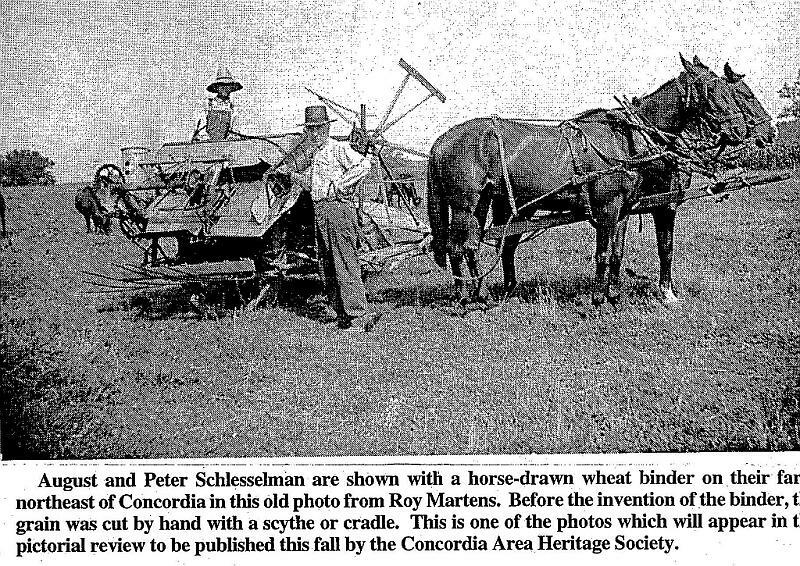 Grandson Roy Martens provided some photos to Nora Hartwig for an article she wrote in the Concordian about the Schlesselmans. A photo from that article is shown below. As for the other two children, the older daughter Anna remained single. August married Lillie Hensiek, who just happens to be the sister of my uncle Henry Hensieck (married to Dad’s sister Flora). Besides the Stuenkels, August Schlesselmann was one of Dad’s favorite relatives. Even though they were actually cousins, Dad always called him “Uncle August”. I think I know one of the reasons Dad particularly liked August. I found a ledger in which Dad kept detailed day-by-day records of everything he earned. It started in his teenage years when he was permitted to strike out on his own. He worked for various farmers in the area; shocking wheat, threshing, plowing, putting up hay, shucking corn, hauling manure, cutting wood, and other odd jobs. Later, he wound up working for some time in a saw mill. In the early years, he worked for August much of the time and was paid the princely sum of $3 a day, compared to $2 a day working for some others. Perhaps someone in the Schlesselman family may know if Peter and Henry Schlesselmann were related. The 1910 census lists the Henry and Emma (nee Brackmann?) Schlesselmann family with six children, George, Emilie, Caroline, Arthur, Henry, and Erna. Emilie married Eilert Luecht July 20, 1910. By 1920, she was widowed and moved back to her parents’ farm with her son, Norman. According to the St. Paul’s Church records, Caroline and Erna married Wilhelm and Martin Blase, respectively during the 1920s. The 1920 census lists Arthur living on another farm with wife Louise, who was born in Minnesota. They were parents of Gladys, Vernon, Vera, and Wilbert. Is this same Arthur who married Mary Runge in 1934? Wife Louise (nee Schlueter) had died the previous year. Finally, how does Fred H. (Fritz) Schlesselman fit into the picture? As noted in the posting above, Grandfather Jacob Pape’s older sister Adelheid immigrated to the US two years before he did. She traveled with her future husband Peter Schlesselman and friend Jacob Martens. Because of their age differences (Peter was 8 years older than Jacob and 13 years older than Adelheid), it is not clear if they knew each other back in Germany or met on the voyage. According to Elva Rehkop (a granddaughter of Peter and Adelheid), Peter was born in Godenstedt, a village three miles northwest of Zeven and four miles west of Adelheid’s home in Meinstedt. So they could have been acquainted. Based on the passenger list shown below, the three appear to have been traveling together. When this information was posted, it was assumed that the Jacob Martens in the group was the Jacob Martens, husband of Anna Eckhoff and father of John H. Martens, who settled on Hamburger Hill north of Concordia. However, Elva Rehkop (who is the daughter of John) pointed out that son John claimed he immigrated to the US with his parents at the age of 2. The 1900 census clearly shows the Jacob Martens family stating that Jacob, Anna, son John and daughter Meta (who married Henry Aversman) all immigrated to the US in 1888. That was two years after John was born and the year that Meta was born. In later census records, the family members are consistently listed as having arrived in the US during 1888. (The younger children Henry, Clara, and Edward were born in Missouri.) However, no records can be found to support the claim that they immigrated as a family that year. So it is not clear which Martens was part of the group that migrated in 1882. The only other Jacob Martens in the area during 1900 was living in Alma. He brought his family to America onboard the ship Gena, arriving in Baltimore, MD on June 21, 1893. In the passenger list, he is listed as a 48 year old teacher, planning to go to Hillsboro, Kansas where he had in-laws. For whatever reason, he decided instead to settle in Alma where, according to the 1900 census, he worked in a brick and tile yard. His daughter Lydia married Oscar H. Kappelman (my mother’s uncle). Oscar lived with the Martens family until he began operating a department store in Alma. The group that arrived in Baltimore, MD in 1882 declared that they were going to Illinois. However, soon after their arrival they show up in the Concordia area where Peter and Adelheid are married in the spring of 1883 and Peter established a farm just north of Concordia. Why did they come to Concordia? This appears to be a case of what is referred to as “chain migration”, namely settling in an area where one has relatives or friends. In 1880, Henry Schlesselmann was already living in Concordia with his wife Emma Brackmann whom he married that year. It is not known if he was the younger brother of Jacob or otherwise related to him. The census for that year also shows a 21 year old John Martens working for a Scharnhorst family, next to the Rev. Biltz parsonage. John Martens had emigrated from Bremen to the US as a 16 year old on the ship Weser that arrived in New York City on Apr. 6, 1874. On Feb. 27, 1881, John married Anna Bruns, the oldest daughter of John Henry Bruns (my gr-gr-grandfather) and his second wife Anna Detmar (or Dittmer). So it is possible that the Jacob Martens in the 1882 group also knew someone in Concordia. When Jacob Pape arrived in Concordia during the fall of 1884, Adelheid was pregnant with the Schlesselmann’s first child, Anna. So Jacob stayed instead at the Louis Stuenkel home. It was a common practice in those days for families to house young boys that had just arrived from the “old country”. Often, the families would board the boys as hired hands and eventually some of them would marry one of the daughters. Earlier, Conrad Stuenkel had boarded Johann von Glahn in that same home. Johann later married Conrad’s youngest daughter, Anna Marie. Another example is Johann Runge, who worked for H. D. Bruns and married H. D.’s youngest daughter, Mathilde. Jacob Pape could not stay long in Concordia when he first arrived in the U.S. He had an obligation to work for a rice farmer in Arkansas to pay off his boat passage. However, during his short stay in Concordia, he struck up a friendship with Louis Stuenkel’s daughter Maria. In later years, Jacob would say that the best way to learn a new language was from a second-grader. (That just happened to be what Maria was at that time.) While working in Arkansas, Jacob contracted malaria and couldn’t wait to move away from there. After fulfilling his obligation, he moved about as far away as he could, namely working in the wheat fields of Washington state. But during his travels, he maintained contact with his friend Maria, signing his letters “Your long-legged friend”. When he finally decided to settle down, he returned to Concordia to be with relatives and his beloved Maria, whom he married after earning enough to buy some farm land from his future father-in-law. As Peter and Adelheid’s Schlesselmann’s family was growing up, John Martens, the son of their neighbor and friend Jacob, began dating both of the Schlesselmann girls, Anna and Ella. After visiting the Schlesselmanns one day, Jacob Pape returned home somewhat downcast and told the family that John Martens had decided to marry the younger daughter, Ella. The family was hoping that he would marry Anna. Poor Anna was heartbroken and never married. John and Ella raised their family on the Martens farm north of Concordia. The children were Lorna, Verna, Roy, Elva (Rehkop), Ralph, and Hobart. As the boys were growing up, John told them never to name their sons Jacob. Why? Jacob Martens was known as the notorious moonshiner from Hamburger Hill. Regardless of which Martens was part of the 1882 immigration, the Martens, Schlesselman, and Pape families remained good friends through the years. Of course, John H. Martens had married Ella Schlesselman. But I also noticed that at Grandfather Jacob Pape’s funeral, two of John’s sons (Roy and Hobart) were pallbearers.